Having a well on your property can be both a boon and the source of several unique problems. When living in an area where your well must be treated, this may also mean your source water is vulnerable to municipal sewage issues. So how do you know what is affecting your well, and how do you handle it? Your well is more complex than it appears on the surface. There are three major factors that can affect the well and must be addressed. Each factor comes with its own list of potential problems. Many of the issues are rare or limited to very specific circumstances. The following sections will include both common and rare problems to illustrate the wide variety of consequences to not regularly maintaining and inspecting your well. A well is more than simply a hole leading to a water source. The walls of both the well and the pocket or source of water can play a major role in contamination risks. In very extreme cases, the surrounding area may seep salt or even arsenic into your well. More common contaminants are sulfur and iron. Periodic maintenance can help to ensure your well absorbs a minimal amount of these substances. Adding a filtration system will provide additional protection. Unlike tap water, wells can benefit from some microbial and mineral content. However, a low heterotrophic plate count is still desirable. The heterotrophic plate count, or HPC, is used to measure the bacterial content of your well. Sudden increases in your HPC can indicate a problem with the well’s distribution system, treatment methods, or an overall change in the bacteriological quality of your well water. The HPC tests themselves act as warning signs when there is a potential problem, and a consistently low count suggests a healthy system. Iron, salt, and other substances can build up over time if your well is not treated regularly. These can create hard water, make water treatment methods less effective, or lead to bacterial contamination. Testing your well water regularly and having your well cleaned will go a long way towards keeping the entire system healthy. You should pay attention to your well’s water levels. In some cases, especially in the case of shallow wells, the water level may be low enough during the summer to require conservation methods. Seasonal changes are normal, but often unnoticed in a healthy well. When buying a house with a well, it is a matter of law that the seller disclose dry wells or other major well issues. 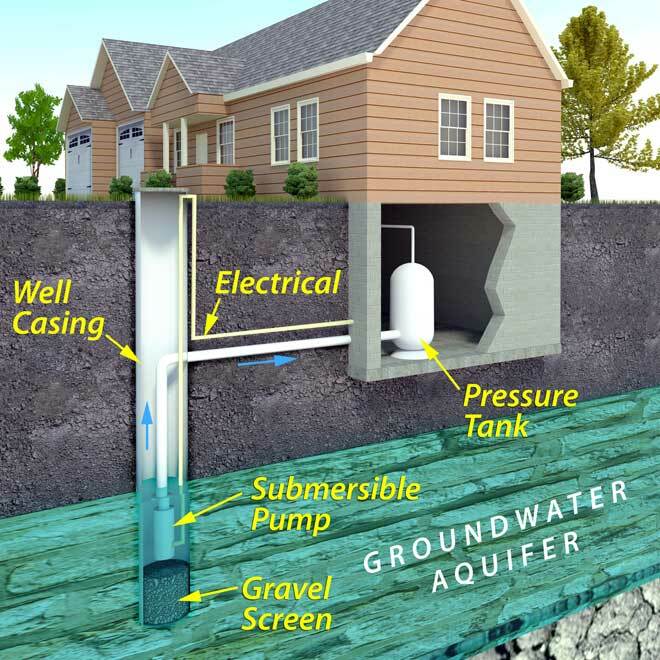 But if you have owned the property for some time before suddenly hitting low water levels, it may be best to hire a groundwater specialist to check your well for signs of structural damage. Even a natural pocket of groundwater can seep through its containing walls if the rock or other wall material becomes damaged. This is especially true of wells in earthquake zones where the ground is more likely to be disrupted. Even with regular maintenance, wells can suffer from the occasional problem, most of which are more of a nuisance than an actual health risk. The cause for many of these problems can be located and possibly solved without the need for a professional, but in some instances, you may want or need to contact a groundwater specialist (or plumber, if the problem is related to your pipes). Sediment buildup is a common issue that can occur naturally over time or may be the result of a more sudden event, such as a major storm or collapsing well wall. In some cases, you can raise your pump to temporarily avoid sediment in your water. However, the best solution is to use a sediment filter and occasionally pump the sediment from the bottom of your well. There are several potential causes of nasty smelling water, many of which may not be from your well. Check all taps, and if only some produce the smell, there is an issue with the plumbing to those taps. Likewise, if only the hot water is affected, the problem lies with your hot water heater. Swirling a glass of water and checking for odor will tell you if the smell is actually originating from the drain instead of the tap. In these cases, a plumber will be able to remedy the problem. Odors which permeate the water of all taps originate either in your well or the supply line, if the odor goes away after leaving the water running for several minutes. A rotten egg smell may be linked to the presence of hydrogen sulfide in the water. When traced to the well, it is important to avoid using the water until it can be treated for potential bacterial contamination. Two articles by the University of Georgia explain the risks of hydrogen sulfide and how to shock chlorinate your well to disinfect it. A musty or moldy odor originating in the well is often caused by pollution from surface runoff. In some cases, it may actually be your reservoir or pressure tank. The common factor is bacterial contamination, and you will need to shock chlorinate your system to get rid of the odor. In some persistent cases, you may need to also install an activated carbon filter. Chemical smells are sometimes the result of treatment. For example, a chlorine smell may be present in recently treated systems, and will usually dissipate after running the water for a few minutes. However, a fuel-like or solvent odor is dangerous, and you should immediately stop using the water and call your local health department. 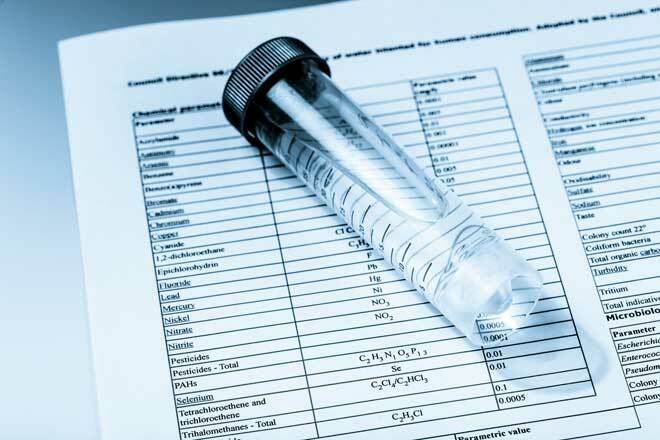 There are many substances which can discolor your water supply. These are commonly caused when rainwater picks up trace minerals on its way through the ground to your well supply. In many cases, the causes share symptoms with other problems, such as odors. This is almost always caused by iron bacteria. This nuisance can cause grimy, slimy water that has an egg or even gasoline smell, can create sludge, stain clothes, and generally be frustrating. While not medically harmful, you will need to shock chlorinate your system and regularly use chlorine treatments. In this case, filters aren’t helpful and may quickly clog. Another potential cause of grey or black water is coal dust. While charcoal is often used to treat water and isn’t harmful, coal itself may lead to some health risks. If you live near a current or former coal mine and chlorine treatments aren’t helping, have a sample tested for the presence of coal sediment. Caused by the presence of copper particles, these colors are usually caused by copper pipelines, but may also be trace to the presence of copper in your water supply. This issue can be potentially dangerous in large concentrations, so you should locate the source and report the presence of copper if it’s in your water source. Red water is caused by the presence of iron particles. There are two types of iron contamination to watch out for. Ferrous iron is sometimes called clear-water iron because it turns water red after sitting for a time. Frequent use of softeners has been known to help to some extent. Meanwhile, ferric iron is red from the moment it leaves the tap, hence its nickname of “red-water iron”. This is treated through the use of filters. Manganese is the most common culprit of brown water, although on some occasions water may turn brown briefly after flushing or treating your water system. Annoying but harmless, yellow water occurs most frequently where water flows through marshy or swampy land and peat soils before ending up in a shallow well or surface water supply. The color is merely caused by tiny particles suspended in the water.